Warm ocean water is melting the largest glacier in East Antarctica from below, according to new Australian Antarctic research. The team of 23 scientists and technicians from the Australian Antarctic Division (AAD), the Antarctic Climate and Ecosystems CRC (ACE CRC), the University of Tasmania's Institute for Marine and Antarctic Studies and CSIRO Oceans and Atmosphere Flagship, returned to Hobart today on Australia's icebreaker Aurora Australis, after taking the first water samples ever collected alongside the Totten Glacier. Voyage Chief Scientist Dr Steve Rintoul, from the ACE CRC, said that until this voyage no oceanographic measurements had been made within 50 kilometres of the glacier. "At 120km long and more than 30 km wide the Totten Glacier is one of the world's largest and least understood glacial systems," Dr Rintoul said. "It drains 538,000 square kilometres of East Antarctica, an area more than twice the size of Victoria. Seventy billion tonnes of ice flow out of it every year, enough to fill Sydney Harbour every two and a half days. "It was thought that glaciers on the East Antarctic ice sheet were relatively immune to the kind of melting taking place on the much smaller West Antarctic ice sheet. But satellite data show that the Totten has been thinning faster than other glaciers in East Antarctica and until now we have not known why." 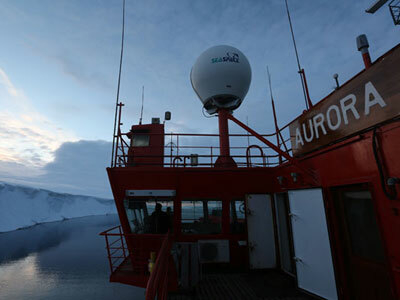 The researchers used new instruments, such as autonomous floats and gliders, designed to sample the ocean beneath sea ice and traditional oceanographic tools like Conductivity, Temperature and Depth (CTD) profilers lowered from the ship. "We also measured chemical tracers of glacial melt water that we will use to assess how fast the glacier is melting." "We will use the data gathered from these instruments at the Totten Glacier to assess how much ocean heat is available to melt the base of the Totten Glacier. As warm ocean waters melt the Totten and other floating glaciers around the edge of Antarctica, more glacial ice can flow into the ocean, raising sea level. "This study will help address one of the biggest questions concerning future sea level rise: how will warming of the ocean affect the Antarctic ice sheet?" The Totten Glacier alone contains an amount of ice equivalent to 6 metres of global sea level rise. Glaciers grounded on bedrock below sea level, like the Totten, are particularly vulnerable to changes in ocean temperature and currents, because the ocean can penetrate deep under the glacier. A key part of the voyage was the recovery of US and Australian instruments moored on the sea bed for up to two years at six different locations adjacent to the Totten glacier. The Australian instruments are part of the national Integrated Marine Observing System (IMOS). The instruments were deployed by the US icebreaker Nathaniel B. Palmer and recovered by the Australian icebreaker Aurora Australis as part of an ongoing international collaboration. "The mooring records will provide the first ocean measurements spanning the full year in this area, giving us an idea of what happens during the long cold winter months when access to the region is impossible," Dr Rintoul said. The seven-week marine science voyage was funded through the Australian Research Council's Special Research Initiative for Antarctic Gateway Partnership, the AAD, the ACE CRC, CSIRO and IMOS. Video available at Australian Antarctic Division.